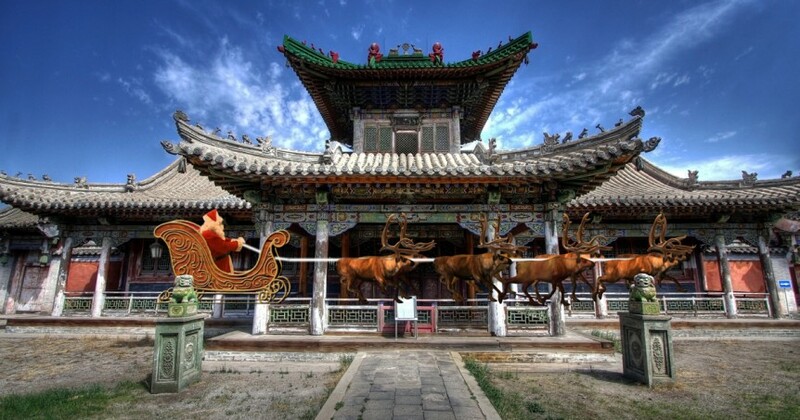 I Spot Santa’s video elf Flip flipped for joy when he was traveling through China and spotted Santa Claus in numerous spots in Mongolia. Santa took a merry ride through ancient temples, local cities and the famous tent city spreading the spirit and joy of Christmas. Mongolia is home to the two humped Bactrian camel whose population has declined in recent years, each year Mongolia has a Thousand Camel Festival to help protect and preserve the Bactrian camel population. A statue of Genghis Khan rises 131-feet outside Ulan Bator and holds the titles of the world’s tallest statue of a horse.